In under five minutes, you&apos;ll get a fun and friendly dose of writing advice. 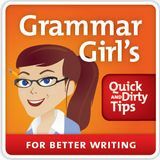 Grammar Girl covers everything from punctuation and grammar to style and voice. QDnow.com.